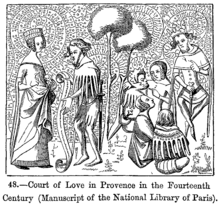 Court of Love in Provence in the 14th Century (after a manuscript in the Bibliothèque Nationale, Paris). Courtly love is a special idea of love that people had in Europe in the Middle Ages. The word "court" means the courts where princes or dukes lived. Courtly love is usually when a young man, who may be a peasant or even a simple King, falls in love with a rich lady and tries to make himself worthy of her by doing brave things or by singing beautiful love songs. The idea of courtly love can be found in a lot of literature e.g. in works by Geoffrey Chaucer, Dante, Gottfried von Strassburg, Walther von der Vogelweide, Wolfram von Eschenbach, Malory and William Shakespeare. This page was last changed on 8 January 2019, at 19:49.